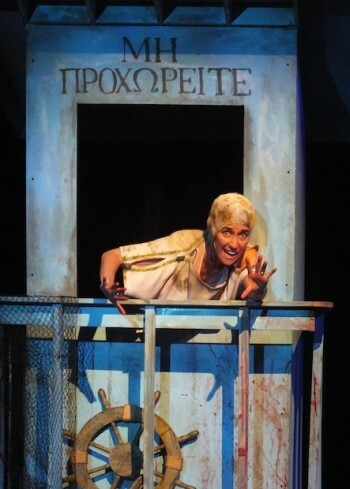 Clytemnestra (Monica Schneider) and the cast of "Abbamemnon." I’m still pretty new to Los Angeles, having only been here two years, but since my arrival, I’d heard plenty about The Troubadour Theater Company. A California staple since 1995, the Troubies, as they’re fondly called, create wacky reimaginings of classic tales, mashed up with popular music. Their titles alone are so clever, from “A Midsummer Saturday Night’s Fever Dream” to “Walkin’ in a Winter One-Hit-Wonderland,” to “As U2 Like It,” that if the show is half as good as the title, it should be a winner. The Troubies’ latest production at the Falcon Theatre in Burbank meets the same juncture of inventiveness and camp. 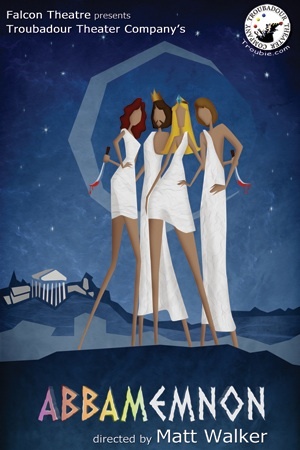 “Abbamemnon,” as you might guess, takes the story of the tragic Greek figure Agamemnon and sets it to the 1970s super (trouper) group ABBA‘s music. A little “Xanadu” and a little “Mamma Mia!” equals a whole lotta camp. At a tight 80 minutes without intermission, the show travels at a clip, with physical and verbal comedy, and plenty of anachronistic and pop culture references. It’s pretty dopey at times, but also funny. They break the fourth wall from the get go, starting with the Curtain’s Speech (to the ABBA tune “Take a Chance on Me”), like Stephen Sondheim’s “Invocation and Instructions to the Audience,” in which they warn the audience not to take photos and to turn off their phones. They also sing a song (a little Carly Simon thrown in with “You’re So Vain”) to embarrass the latecomers. Not that they don’t deserve it, though to be totally fair the show started exactly on time, if not a moment early, because my clock after the latecomers song read only 8:05. While I’m generally not a fan of jukebox musicals (musicals built around a pre-existing group of songs), I did enjoy the show “Mamma Mia!” (the movie not as much). The difficulty, however, is that the music is sturdy enough to stand on its own—a major reason jukebox musicals are so popular: everyone already knows the music, and the nostalgia factor is very strong. The problem is, I tend to want to sing along. With “Mamma Mia!,” the lyrics aren’t really changed, so it’s possible to do that, but Abbamemnon, is a parody. They’ve rewritten many of the lyrics to fit the story, so it’s necessary to pay attention, which is sometimes difficult with music you know so well. Beth Kennedy as a Watchman in “Abbamemnon.” Photo by Chelsea Sutton. It’s an odd mix to combine Greek tragedy with the freewheeling, one-night-stand era of ABBA’s 1970s, and it doesn’t always work. They’ve even rewritten the ending slightly to maintain its comedy status, and throw in one more ABBA song. I’m curious to see another Troubies show, based on a less complicated story, to see if it’s any easier to follow. The players execute their roles very well, though I enjoyed Monica Schneider’s Clytemnestra more for her acting than her singing. The audience certainly enjoyed it (there was one particularly vociferous woman in the front row). Matt Walker’s direction (he also cleverly played Abbamemnon), and Molly Alvarez’s choreography captures the feel of ABBA’s 1970s, and it’s performed by some very strong dancers, particularly Joseph Keane, who plays a Herald, and Katherine Donahoe, as Cassandra, who walks around with her arms stretched over her head for a good portion of the show (more exhausting than it may sound). The players engage the audience, walking among them and drawing them out, not just for coming in late. Beth Kennedy, who plays a Watchman and is a producing director of the company, is especially entertaining, with a Marty Feldman talent not seen often. Clockwise from top left: Matt Walker, Katherine Donahoe, Rick Batalla, and Monica Schneider in “Abbamemnon.” Photo by Chelsea Sutton. As a non-native Californian, there were a couple local jokes I didn’t get (including pandering about the Kings’ recent Stanley Cup victory), but most of it was clear enough. Despite being silly and a bit dopey, the show is tight and entertaining enough for an enjoyable evening out. Though mostly local to Los Angeles, the Ovation-Award-winning Troubies have played in many cities throughout California and in other parts of the country and the world, including Hailey, Idaho, and Adelaide, Australia. If you see them in your neck of the woods, give it a shot. 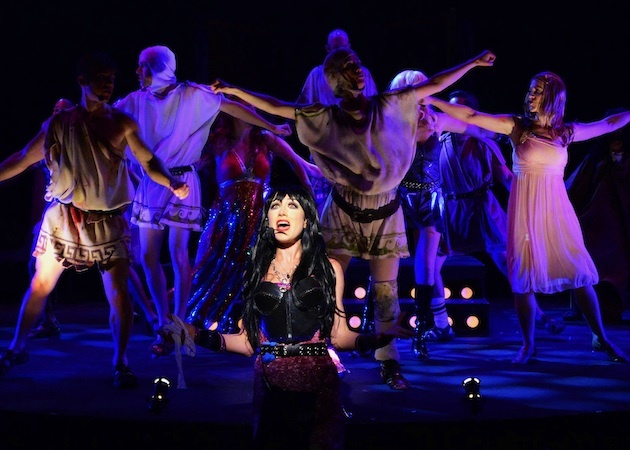 Abbamemnon is playing at the Falcon Theatre in Burbank through July 13, 2014. Update: I initially wrote that Garry Marshall is the president of the Troubadour Theater Company, but that’s incorrect. He is the owner and president of the Falcon Theatre, but is not directly connected with the Troubies. Matt Walker is the Troubies’ Artistic Director.